We have arrived at the last month of 2016! Can you believe it, man that was a fast year. Fast is the perfect segway of how the real estate market in Portola Hills performed in November. The average days on the market for homes sold in November was just 29 days. 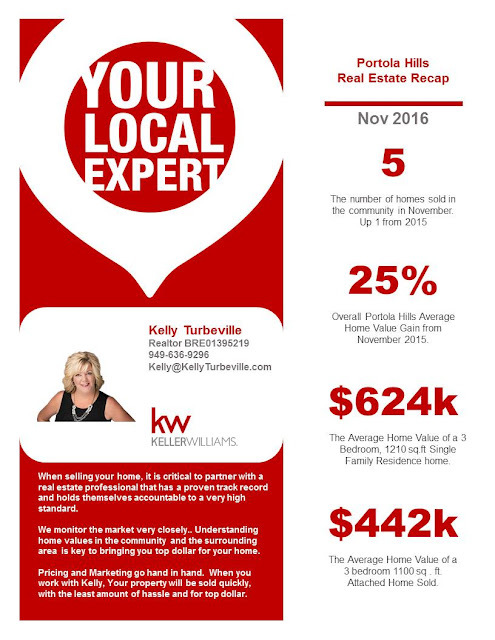 Who would buy a house in November or this time year with all the holiday stuff going on? This is often what we hear, but as we are in South Orange County and not hampered by the snow, etc. November is traditionally a fairly busy month in the OC for real estate. For the county, 2419 homes sold in November that is up about 20% from 2015. For Portola Hills the number of sales was up by one property but take a look at the price increases from 2015 below. The average price of a single family home in November 2015 $693,000 but that was for a 2284 4 bedroom home. The price per square foot was $310. Now looking at 2016, the average home price was $624,000, but that was for a 1210 square foot home at the price per square foot of $412. On the condo/townhome side in 2015 the average price for a 2 bedroom 1100 foot condo was $380,000 in 2016 for the same size home the average sales price is $442,000. I always emphasize mix is always important to look it. But what the numbers have indicated all year for Portola Hills is the area is in demand. Inventory overall remains low and is anticipated to remain low through the end of winter. Home sellers have a unique opportunity, especially before the new homes hit the market in Portola Center, to receive top dollar for their home. Of course, pricing your home at fair market value, making it presentable, marketing it and ensure it is available to show are all crucial steps in the mix. If you are thinking of a move, please don't hesitate to contact Realtor Kelly Turbeville to review the current market.